Peter Jackson's ghost thriller/comedy about a paranormal detective that tracks down a ghostly serial killer who has continued his spree from the afterlife was a minor flop in its day. But since LOTR, The Frighteners has gotten a worthy second look. The film got an early HD-DVD release from Universal a few years ago in the form of a director’s cut, which adds another 12 minutes to the film. The DVD also comes with a full-length comprehensive documentary cut by Jackson himself, which he original shot specifically for its LaserDisc release in 1996. The Frighteners must have bad luck because it helped kill off two obsolete formats. Michael J. Fox plays Frank Bannister, an ethically-challenged detective with a unique ability to see and communicate with the paranormal. To make money he employs the help of a couple of his ghost buddies – Cyrus (Chi McBride) and Stuart (Jim Fyfe) – to haunt people’s houses and con them into retaining his services. Bannister's immorality stems from the traumatic murder of his wife, which he witnessed and which gave him the power he possesses today. But a new ghost has arrived in town and starts killing people in the same manner in which Frank’s wife was killed – marked with a number etched into the victim’s forehead. Frank is accused of the murders through his association as a ghost-hunter. With the help of Lucy Lynskey (Trina Alvarado), a widower whose husband was one of the numeric victims, Frank tracks down the murderer and comes face-to-face with the demon from his past. The film is an ambitious effort because it plays on many different tones and genres. The opening establishing scenes are played as pure comedy. The central relationship is Frank and his ghost pals. Chi McBride, Jim Fyfe, John Astin and R. Lee Ermey provide caricatured characters that easily bring you into the story. Jackson and his spouse/co-writer Fran Walsh gradually pump in the fear in the second act and intrigue us with some unexpected plot twists. The lengthy final act wears out its welcome and goes over-the-top with a drawn out cat-and-mouse confrontation/gunfight. Apart from the bloated finale, the film unfolds and reveals itself with great intrigue. Jackson skillfully retains the light comic tone for as long as he can. Eventually, he has to let go and get down to the business of solving his morbid tale. His introduction of the quirky FBI detective is a welcomed addition to the second act, but then in the finale he needlessly turns him into an ugly neo-Nazi. This misstep still doesn't work. Michael J. Fox holds the film together well even though he is played against type. He’s a broken man without the fast-talking repartee we are used to in his more famous roles. His dramatic arc brings him from apathy to despair and back up to redemption at the end. Fox had already been diagnosed with Parkinson’s at the time, though he had not gone public with his condition. Love or hate the film (most people are in one of these two camps), it's perhaps most significant for being Michael J. Fox's last leading role on the big screen. I'm glad The Frighteners got a second look after Peter Jackson's success with the LOTR trilogy. 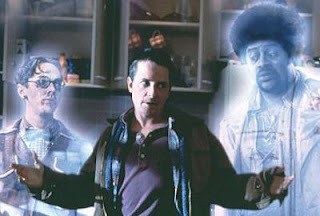 I personally LOVED The Frighteners because it was a great mix of comedy and suspense. The actors are phenomenal, too: Michael J Fox is of course amazing, and I really liked Dee Wallace's portrayal of Patricia. She's recently become one of my favorite actresses.. I actually just read her autobiography, Bright Light, and it was really inspiring. I've been going back and re-watching some of the movies she's been in.